Encourage sweet nothings, gratitudes, and compliments with this sweet message box. 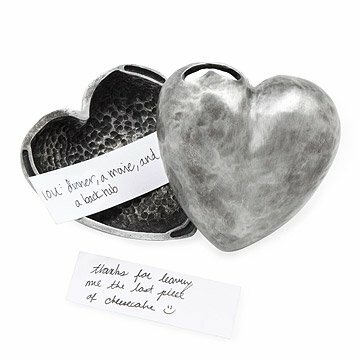 Keep relationship communication flowing by putting thank yous, gratitudes, and sweet nothings inside this charming pewter heart. Designed by Tamara Hensick, the heart comes with 104 slips of paper (one for every week of the year for each partner) that offer a small space to write down and share a sentimental thought, kind compliment, or a flirtatious quip. Roll or fold messages through the heart-shaped hole in the top- the heart separates to let you retrieve the messages, which can be read together weekly, monthly, or on a special anniversary as a time capsule of loving words. Paper cut and padded in San Antonio, Texas; Heart cast in Lincoln, Rhode Island. Tamara Hensick is a sculptor whose muses are manifold, and range from ideas and idioms to funny notions, stories, and fairytales. Her first piece was a chicken wishbone molded and cast in sterling silver to inspire one to always make wishes. Sculpting in soft, malleable jeweler's wax and hardening clays, her finished designs are molded and cast in various metals. Her collection of cast pewter, sterling silver, and bronze pieces include organic, figure, animal, and object motifs that bring a saying, idea, or whimsical phrase to life. Visit our blog to read about Tamara's heartfelt collaboartion with our Product Development team. This little handmade heart box with a slot where the couple can slip in tiny notes to one another bearing their thoughts and feelings captures the importance of words in maintaining a healthy relationship. I can't say enough good things about this gift. As a daily reminder of our love. Big Luscious, she calls me. My wife and I look forward to little notes that brighten our day! It's nice quality and heavy. I purchased the box for my husband as an anniversary gift . Thought it's very unique and creative. Can make it a part of fun, flirty, emotional moments...the only feedback is ---it's a little big. May be go a size down to make it look more compact and cute. We dont need such a big space to put a small text message. What a wonderful way to express your thoughts and wishes with this beautiful heart box. Sent to a client couple who are moving to FL from CA, I am their realtor and wanted them to have a little heart for their new home. They loved the thought and product. It was the perfect gift for them! My wife and I use for asynchronous communication to remind ourselves of the little things we appreciate about one another. Love this!! Great quality and weight!!! I love this, it's great quality!! I keep it alone with a pen at the top of our staircase and my husband and I leave lil notes.... Good, bad, or indifferent!!! It's such a great idea to let your loved one know just a lil how you feel sometimes!!! Love when I get ready to leave for the day and I see a lil note sticking out, after we read them we date them and put them in a wine bottle!